Yarn: Cascade 220 Superwash. Less than 3 skeins; not sure how much less, because I made another sock with some of it. Still on the needles so he can try it on before I finish it. Those are fantastic! They look so warm, too. Thanks! That's the idea - my dad always has cold feet. Beautiful, plus they look really comfy. I really love 'em. 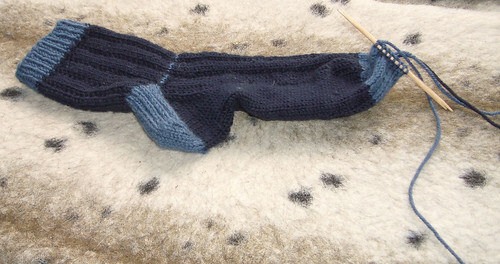 I need to learn to knit socks as soon as I'm done with my current project. I may come to you for hints. Maybe a cafe visit will be in order! Cool! I hate navy blue, it would drive me mad. Nice work! 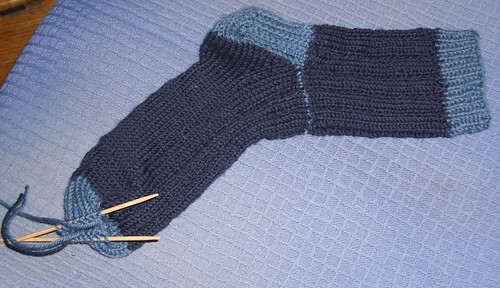 You've inspired me to give knitting socks a try.